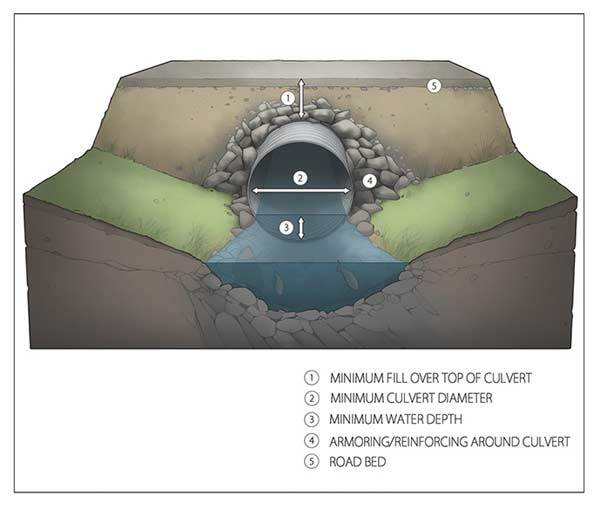 The fill above the culvert must be 12 inches of 0.5 times the diameter of the culvert, whichever is greater. For example, a 20-inch culvert must have 12 inches of fill above the pipe, while a 40-inch culvert will need 20 inches of fill above the pipe. IDL Forester Forum Forest Practices No. 12 – Fish Passage Guidelines When Installing Stream Crossings. IDL Forester Forum Forest Practices No. 14 – Correctly Classifying Streams to Protect Fisheries and Domestic Water Supplies.